Several days ago, someone asked me some questions about my future that I honestly couldn't answer. It's not the first time this has happened to me. When you've grown up on a small island where everyone knows you, these kinds of interactions are the norm. So in that moment, I gave the answer that seems to be the default one in my life lately. I said, "I don't know." I was taken off guard and not sure what else to say, but as I revisited the conversation in my head later on, I realized my answer was incomplete. Up until a few years ago, I had all the plans. I had a five year plan, ten year plan, probably even a twenty year plan. I thought I had my life entirely figured out... until one day I realized I didn't. Over a period of a few months in early 2016, I started to question a lot of things in my life. The five year plan I had come up with during my college years wasn't exactly unfolding the way I expected. The more I thought about the future, the more anxious I became. I started looking everywhere for answers, except for the one place I knew I could truly find them: in the arms of Jesus. On April 6, 2016, I made a decision to surrender my life and plans to the Lord, to finally obey the call I'd heard for so long and seek Him with my whole heart. And that I did. Almost two years later, I still haven't found all the answers that I was seeking. But I've discovered something better: hope and confidence in the One who does have the answers, the One who loves me with an everlasting love (Jeremiah 31:3) and has engraved me on the palms of His hands (Isaiah 49:16). In just twenty months, God has turned my life upside down and filled it with new passions, dreams, and desires. He has given me a new sense of purpose in my life, a passion for His Word, and has placed a burning desire in my heart to share it with others. I am still full of questions, probably even more than before. Surrendering my plans to Him has been difficult and admittedly scary, but with surrender comes freedom. Day by day, I am learning to live by the promise of Matthew 6:33-34. A few months ago, God planted a new dream in my heart, one that wasn't on my original five or ten year plan - to pursue an online master's degree in Christian Ministry. It's a big dream, an exciting dream, a scary dream, but I'll be honest - I have no idea how God will use this dream or what exactly it means for my life and future. I may not know how He will use it, but I know He will. I don't have all the answers and I'm learning to be okay with that. I'm also learning that oftentimes faith requires action without answers. In the words of Martin Luther King, Jr., "Faith is taking the first step even when you don't see the whole staircase." 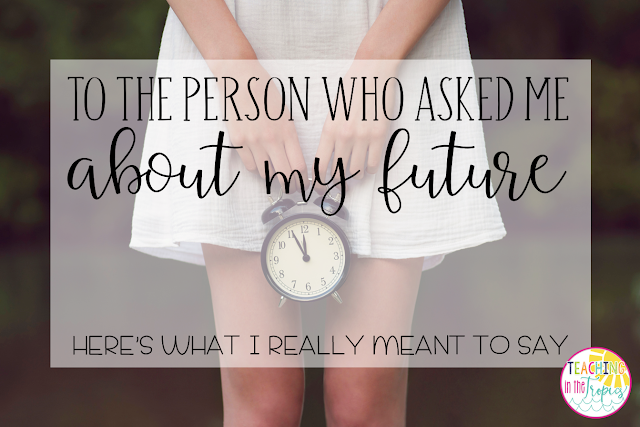 To the person who asked me about my future, I meant what I said to you a few days ago. I was telling the truth when I said, "I don't know." But what I really meant to say was, "I don't know, but God knows." I will never have all the answers, but I can trust in Him because He does. I no longer have a five or ten year plan and maybe that seems foolish. But I've realized that a plan without God is one that isn't worth making. I've realized that I would rather walk with the Lord day by day - even if it is painfully slow - than run ahead of Him. He's teaching me that my purpose isn't found in the answers; my purpose is found in Christ. As I enter this new year, I will still ask questions, have dreams, and yes, even make plans, but hold onto them loosely. In 2018, I will choose to cling tightly to the only permanent thing in a world full of temporary - the hope I profess in Christ (Hebrews 10:23). In 2018, I will cling to God's promises and His truth, with the assurance that He is working in all things for my good and His glory (Romans 8:28).